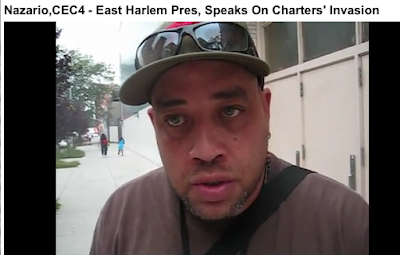 More on the District 4 charter school "hearing"
Last Wednesday’s “hearing” in El Barrio/East Harlem on the Hyde Leadership and Mott Hall charter school proposals was attended by more than 40 people, most of whom showed up to protest placing these new schools into District 4 public school buildings. We wrote about some of what occurred at that meeting yesterday. Since minutes weren’t taken (even when requested), there won’t be a record of the opposition to those charters filed anywhere. You could say what does that matter, since these schools are already a done deal. The truth of the matter is that the only reason charter schools want to be in public school buildings is because they save a whole load of money. . . They don’t give schools a chance . . .
My belief is that the Mayor and the Chancellor want to get rid of public schools in general . . . I think in the future everything is going to be corporate, business. Everything’s going to be charter, you will never hear of public school again. Nazario has a lot to say. You can watch the full video segment here.